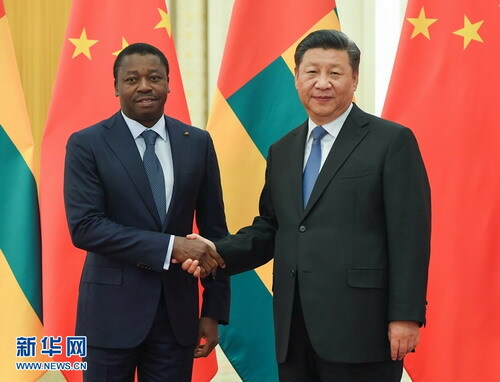 BEIJING, Sept. 6 -- Chinese President Xi Jinping on Thursday met with Togolese President Faure Gnassingbe after the 2018 Beijing Summit of the Forum on China-Africa Cooperation concluded Tuesday. 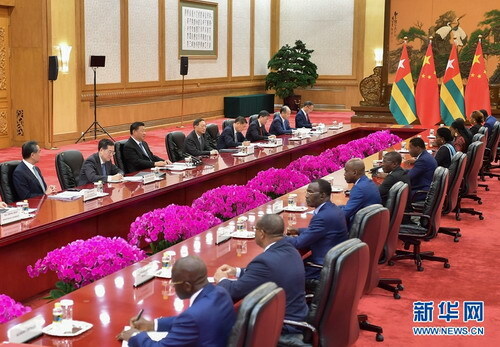 Noting that the enduring friendship and fruitful cooperation between China and Togo have set a model of South-South cooperation, Xi said the two sides should fully leverage the advantages of mutual political trust and friendly interactions between the two peoples, strengthen strategic communication and coordination, and continue to support each other on issues of their core interests and major concerns. Togo is welcome to participate in the Belt and Road construction, Xi said, adding that China stands ready to work with Togo in areas including ports, agriculture, power supply and infrastructure. Xi said the two sides should upgrade their pragmatic cooperation toward the integration of investment, construction and operation, enhance people-to-people exchanges, and deepen cooperation on the maritime security in the Gulf of Guinea. China supports Togo in playing a bigger role in African affairs, Xi added. Faure Gnassingbe congratulated China on the success of the Beijing summit, which elevated the Africa-China comprehensive strategic and cooperative partnership to a new level. African countries highly commend the eight major initiatives proposed by President Xi at the summit and will make joint efforts with China to build an even stronger China-Africa community with a shared future, he said. Cherishing the friendship with China and appreciating its long-term support, Togo is willing to learn from China's development experience, leverage its own regional advantages and participate in the Belt and Road construction, so as to speed up the development of its agriculture, digitalization and poverty reduction, he said. Faure Gnassingbe also expressed Togo's support for China's propositions on the international arena and willingness to strengthen communication and coordination with China on multilateral affairs. "Togo will always stand together with brotherly China," he said.